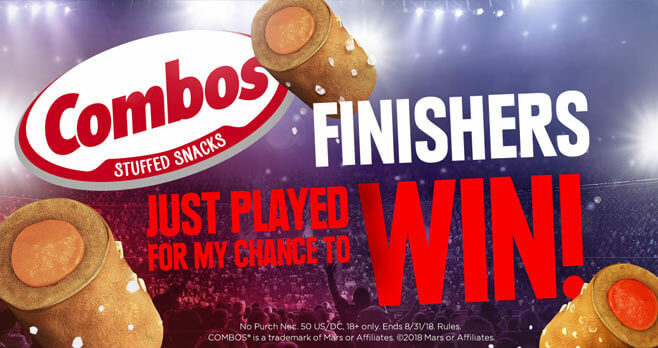 Visit www.combosfinishers.com now through August 31, 2018 and enter the COMBOS Finishers Sweepstakes for a chance to win Wrestlemania 35 tickets, a replica Championship title belt, WWE swag, gift cards, and 1,000 promo codes from the WWE Network. Eligibility: The COMBOS Finishers Promotion is offered only to legal residents of the 50 United States and the District of Columbia, who are 18 years of age or older at the time of entry. Promotion Period: The Sweepstakes starts on or about 12:00 p.m. ET on August 1, 2018 and ends at 11:59:59 p.m. ET on August 31, 2018. Limit: Limit one entry per person or e-mail address per day. Prize(s): The grand prize consists of One (1) WWE-Replica Championship Title Belt; Two (2) tickets to WrestleMania 35; Two (2) tickets to a local WWE live event near winner’s residence with Superstar meet and greet; Two (2) WWE tshirts; and Ten (10) $25 WWE Shop Gift Cards..